For this outdoor lighting project our customer wanted to change the existing lighting he had on top of the historic water tower in Dayton, NV. The lengths of the tree shaped metal framing that already existed were fairly long and would have taken a lot more wiring and controls for our brightest RGB strip lights. So they opted for our outdoor rated Ribbon Star Extreme RGB Strip, which can be connected up to 100ft in series and also only consumes 1.4 watts per foot of lighting. The linear lighting strips were easy to customize and then their were only a few more steps to connect the leads to our RGB Color Controller, which then was powered from the 240W 24VDC Power Transformer. With the new setup the owner can now choose from 16 million color tones and will surely make this nighttime attraction a known site in the small town of Dayton, NV. Our high end UL Listed Ribbon Star Extreme RGB is a fully outdoor rated, durable, and color changing LED Strip Light that can be connected in series up to 100ft (30m). Using 2 positive wires (V+) and 3 negative wires (RGB) this strip can achieve longer serial connections than a standard RGB strip light. Be sure to share your positive wires to your RGB control source for the entire strip to work in unison. With an encapsulated commercial grade waterproof silicon coating our Ribbon Star Extreme RGB is IP67 outdoor rated, making it fully waterproof (non-submersible), dust and UV proof. Ribbon Star Extreme RGB LED Strip Light provides a perfect light source for any outdoor lighting projects. 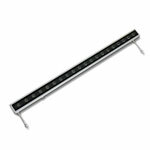 The Strip Light can be cut every 9.5 inches and has multiple connection options that can be waterproofed to suite your projects needs. 7 SMD LEDs per 9.5 inches with a total of 84 LEDs per 3m. At 1.7W per foot, a 3m roll would require at least a 17W, 24VDC power supply. At the maximum series length of 100ft (30m) this ribbon would require at least a 170W 24VDC Constant Voltage power supply. 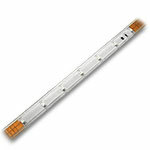 This LED strip light is perfect for any outdoor or architectural lighting project. Use with landscape features, decks, trailers, boats, RV's, dog kennels, landscaping, business trim, pathway lighting, pools, or any other situation where a weather proof LED Strip Light is needed. Comes with 10 mounting clips for a permanent mounting solution. Requires a 24VDC Constant Voltage power source. UL Listed for class2 luminaries and fixtures, RoHS and CE approved. This Mini Waterproof 5-24VDC RGB LED Controller is loaded with functionality and has an RF remote range of up to 50ft. It can be used to control color effects for common anode style 5-24VDC constant voltage RGB LED Lights. 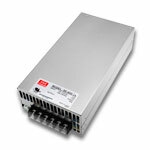 With 4A per channel output this controller can handle 60W at 5VDC, 144W at 12VDC, and 288W at 24VDC. Functions include 30 static colors with 5 levels of dim (minimum dim level %30), and 43 varieties of color flashing, strobing, and fading modes with 10 levels of speed adjustment. Each remote can be paired with a controller by pressing the power button and pause together within 5 seconds of DC power to the controller input. Power input is connected by 16AWG bare lead wires, and and signal output is connected by 18AWG bare wire leads. For quick and easy wire connections use some of our wire snap connectors found below. The mini controller (not remote) is IP68 waterproof rated but not designed to be submersed in water or directly exposed to outdoor elements. This product is a Mean Well brand waterproof LED power converter with a 100-240VAC, or 277VAC (North America Only) input and a 24VDC 10 amp output of 240W. IP67 rated for wet or damp locations. This LED power supply can be used to power 24VDC Constant Voltage LED Wall Washers, LED Lights, LED Light Ribbons, RGB LED lighting and other 24VDC LED Lighting products. Comes with built in PFC (Power Factor Correction) as well as short circuit protection. 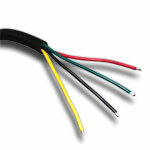 AC input wire colors are as follow: Brown - Load, Blue - Neutral, Green - Ground. The manufacturer recommends a 92.5% max load of 222 watts. 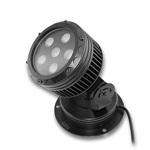 Non-submersible, non uv-proof, UL recognized, RoHS, and CE approved.